Like leftover rice, we sometimes buy too much of something. In this case, we were on a ground turkey kick (gobble gobble) and this turkey needed to be cooked. 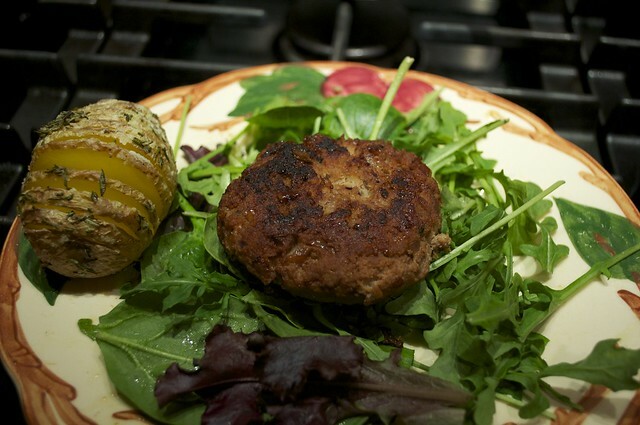 So we made turkey burgers, and they were awesome! We obviously want to share our wonderful recipe with you! Chop the red onion in fine dice and place in a mixing bowl. Add the turkey meat, and season with salt, pepper, garlic powder, and onion powder. Gently mix ground turkey meat, seasoning, mustard, a few sprinkles of worcestershire, and red onions together. Until the meat breaks down. But don’t overwork the meat. That tends to make the meat tough when cooking. Sprinkle in some breadcrumbs, start with 1 tablespoon. This will help bind the burger together. You don’t want it too moist, or too dry. Dived the meat into four 4oz patties. Place a saute pan on the stove turn on heat to medium high. Coat the bottom of the pan with the oil of your choice, wait until the pan and oil are hot. Place the patties in the pan and cook for 3 to 4 minutes on the first side. Flip and repeat on the other side until internal temperature reads 165°. Serve over mixed greens with your favorite dressing (we used a honey mustard dressing…yum) and enjoy!